Live coverage for Progress M-19M. Progress M-19M (419) arrived at Baykonur on January 27, 2013. According to TsENKI, Progress M-19M was transported to the vacuum chamber on February 28. 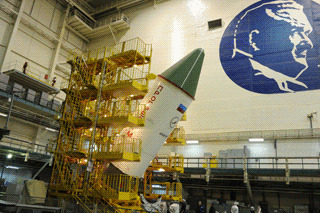 Launch is planned on April 24 at 1012UTC, using the 11A511U Soyuz-U (Л15000-138) launch vehicle from the PU-5 LC1 'Gagarinskiy Start' (17P32-5) launch complex. I was told the launch will be moved to April 22nd soon. Is the launch time known? Somewhere around 09:30 Zulu I guess? Because of conflict with Bion-M launch, Progress M-19M will be launched on April 24th and use two-day rendezvous scheme with ISS. Yes. The problem is if Bion-M launch will be postponed to April 20 then Progress M-19M can not be launched on April 22nd. So Roskosmos has decided to use April 24th launch date for Progress M-19M. The launch time is 10:12:17 UTC. According to NK forum, the docking is planned on April 24th at 12:28 UTC. According to http://www.gctc.ru/main.php?id=1967 , a new Russian treadmill will be delivered to replace the good old TVIS on this flight. The Technical Management meeting took place, which made a decision to fuel Progress M-19M cargo vehicle with propellant components and compressed gases. Progress M-19M cargo vehicle fuelled with propellant components and compressed gases was delivered to the Spacecraft Assembly and Testing Facility for final processing operations. So the Glonass launch will be in between this launch and the docking, if all goes according to plan? "The launch is planned at 05:23:41 UTC on April 26th." Cool!!! Busy rest of the month, that's for sure! Yup, although don't expect any webcasts for any Soyuz launches out of Plesetsk. Designers inspection of the Progress M-19M cargo vehicle was completed. Payload shroud roll on to the Progress M-19M cargo vehicle was performed. Orbital module of the Soyuz-U launch vehicle, containing Progress M-19M spacecraft was transported from the spacecraft processing facility for the general integration with LV.